Exterminate It! is a powerful antimalware solution that will keep your Internet-connected PC or notebook malware-free with ease. Personal Updates and a huge malware database will help you stay protected. Feel the meaning of Real Personal Protection with the “Submit State” feature — the fastest possible responder to malware threats. You will get a database update containing a remedy for your specific malware problems within 24 hours! Guard Yourself, Your House, and Your Family against Digital Threats using 2, 3, 5 or 10 subscriptions pack. Please note, that all the prices shown are for one-year subscription. Exterminate It! is compatible with other security software suites. This way, you can get combined antimalware protection. All payments are processed by MyCommerce.com (former RegNow.com) - an industry leader in providing e-commerce and online credit card processing services, so you can be sure about the security of your payments and personal information. If the payment page is blocked by malware try to use this alternative link. When the processing of your payment is complete, an activation code will be displayed and sent to the e-mail address you specified on the Purchase Details form. 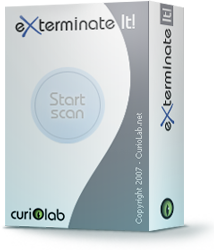 You need to enter this code on the “Activate” screen in the application to activate your version of Exterminate It!. Activating Exterminate It! will give you access to all the functionality of the application.